Whenever American League President Joe Cronin was asked to rank big-league third basemen, he always gave the same answer: “Well, you start with Bluege.”1 Of course shortstop Cronin was referring to his old partner on the right side of the Washington Senators teams of the 1920s and ’30s, Ossie Bluege. At the 1970 World Series, watching Baltimore’s Brooks Robinson make one outstanding play after another, Joe would remark “That’s another Ossie Bluege play.”2 He would often comment that he never had to worry about a ball that was hit to his right side with Bluege manning the hot corner. Bluege was known as a quiet, unassuming type of person who went about his job without much fanfare. He never popped off or brought attention to himself. He did not drink, smoke, or keep late hours. He was a virtual unknown to many. In spite of his anonymity, Bluege was a member of the Washington Senators for 18 seasons, served as a coach for two, and managed the Nats for five more. He was the franchise’s first farm director and worked as the comptroller, and later executive secretary, when the organization relocated to Minneapolis. When he retired in 1971, Bluege had worked 50 years for the same franchise. Indeed he was a company man. Oswald Louis Bluege was born on October 24, 1900, in Chicago, one of three boys (himself, Hugo, and Otto) born to Adam and Olga Bluege. Adam Bluege was employed in a factory as a box maker. He grew up in Goose Island, one of the toughest neighborhoods on the Windy City’s South Side. Adam’s surroundings did not deter him from playing ball on the Chicago sandlots, and at 14 he started at shortstop for the St. Mark’s Lutheran Church team. Bluege reported to Peoria in July and started at shortstop; Charlie Dressen had the third-base position all to himself. Although he performed well, he found the routine to be monotonous. He was prepared to return home, but Jackson, his manager, encouraged him, told him all the right things, and in the end persuaded Bluege to finish the year. He returned to Peoria in 1921, hit .293 and led the team in triples (15). A scout for the Philadelphia Athletics secured an option on Bluege. But when it was learned that he had injured his left knee during the season, the A’s let the option lapse. Senators scout Joe Engel was still interested in Bluege and wanted him to test the knee. He lined up Bluege with two other players and told Ossie that if he beat them in a footrace across the field, to the center field fence, he had a job. Bluege won the race. The following year at spring training, Washington manager Clyde Milan spent about an hour hitting groundballs to Bluege. 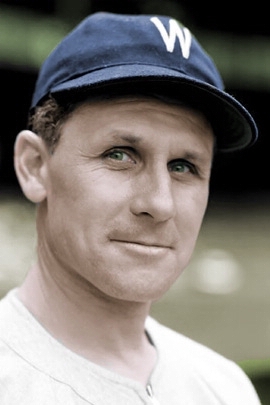 Shortstop Roger Peckinpaugh was in a salary dispute, so Bluege filled in until Peck reported to the club. Bluege flashed his defensive prowess when he and his keystone partner, Bucky Harris, combined for six double plays in one game against the Athletics. Milan was so impressed with Bluege that he made special mention to Clark Griffith, the Senators owner. “Griff Strong for Windy City Rookie,” read the headline from spring training. His capability convinced the Senators they should keep him as a utility infielder. Early in the 1922 season, third baseman Bobby LaMotte was injured and Milan inserted Bluege at the hot corner. From then on Bluege manned third base. However there were questions about his hitting ability and Bluege was sent back to the minors, this time to Minneapolis of the American Association. He batted .315 for the Millers in 44 games. Bluege returned in 1923, and over the next three seasons, the Senators sported one of the top infields in the majors. Joe Judge at first base and Harris at second formed a formidable right side to go with Peckinpaugh and Bluege. Future Hall of Famers Goose Goslin and Sam Rice manned the corner outfield positions and provided solid offense. Before the 1923 season, the Senators acquired Muddy Ruel, a solid, veteran backstop from the Boston Red Sox. Walter Johnson was the leader of a competent pitching staff, posting back-to-back 20-win seasons in 1924 and 1925. Harris took over as manager in 1924 and led the Senators to consecutive pennants in 1924 and 1925. The Senators faced the New York Giants in the 1924 World Series, and found themselves down three games to two. But Tom Zachary won his second game of the Series in Game Six, and Johnson pitched four innings of relief in Game Seven to clinch the world championship for Washington. The following year, their opponent in the fall classic was Pittsburgh. However, luck was not with the Nats this time around. In Game Two Bluege was hit behind his left ear on a pitch from the Pirates’ Vic Aldridge. Knocked out, Bluege was taken to the hospital where X-rays were negative. The doctor whose care Bluege was under told Clark Griffith, “We believe Mr. Bluege’s skull is the thickest we’ve ever X-rayed.”9 Bluege returned to the lineup for Game Five, and stroked a double off Aldridge. Over the next several years, the Senators finished in the upper half of the American League, as the Yankees and then the Athletics flexed their muscles as kings of the junior circuit. Bluege was at the top of his game, leading the league in fielding in 1931 (.960) and in multiple years in games started, assists, and innings played. Although he hit anywhere from .271 to .295 in his prime years, he was overshadowed by stronger offensive players like Judge, Rice, Goslin, and later Heinie Manush, Joe Kuhel, and Joe Cronin. One of the most difficult adversaries for any American League club was Ty Cobb. Contrary to popular belief that Cobb was a dirty player, sharpened spikes and all, Bluege had a different recollection of him. “He would fake a slide, as if going directly for the baseman, and at the last minute throw his body in the opposite direction, away from the infielder and the base. He would overslide, then reach for a corner with his hand.”11 The basepaths belonged to the baserunners. Get in their way, and you could get hurt. Ossie’s younger brother, Otto, made his major league debut with Cincinnati in 1932. He was on their roster for 1933 as an infielder, and never played in the major leagues again. The Senators won their third and last pennant in 1933. Washington led the Yankees by one game in late July, and then went 38-17 through August and September to take the AL crown by seven games. Like Bucky Harris before him, Joe Cronin led the Nats to the World Series in his first season as manager. General Crowder and Earl Whitehill each won more than 20 games to lead the mounds corps. Six of the eight regulars hit .295 or higher, giving the Nats a well-rounded offensive attack. The 1933 season was Bluege’s last as a regular. The emergence of Cecil Travis gave Cronin good reason to make the switch. The young Georgian might not be able to field like Bluege, but he could hit like no one’s business. From 1934 through 1941, Travis batted over .300 all but one year, and in that season he hit .292. Bluege showed his versatility, moving over to shortstop to replace Cronin, who had been shipped to Boston before the 1935 season to become the Red Sox’ manager. When second baseman Buddy Myer was sidelined the next season with a stomach ailment, Bluege moved over to the keystone position, started 50 games, and hit .311 while playing second base, and .288 for the year. Bluege retired as a player after the 1939 season. He had played in 1,867 games with 6,440 at-bats and hit .272. He started 1,454 games at third base, fielding the position at a clip of .957. The Senators showed great improvement in 1943, Bluege’s first year, finishing in second place, 13½ games off the pace. The Yankees were never seriously threatened in their march to their pennant. Still, the Senators’ 84 victories were an improvement of 22 games from the previous season. After a last-place finish in 1944, the Nats finished second again, but this time to the Tigers, by a mere 1½ games. The Tigers were leading by a half-game on September 14 when they faced the Senators in a five-game showdown at Griffith Stadium. The Tigers took three out of five, to increase their lead. Washington lost two straight at Yankee Stadium, and the race was all but over with only three games left on the schedule. Bluege was named Major League Manager of the Year by The Sporting News in 1945. With many players still serving in the armed forces, it became necessary to find players from all corners. Such was the case with Bert Shepard, a career minor leaguer. Shepard was a fighter pilot in World War II and was shot down during a mission over Berlin on May 21, 1944. A German army doctor amputated his leg and Shepard was freed in a POW exchange in February 1945 with an artificial leg made by a fellow POW. Griffith, sensing a morale-boosting tale, invited Shepard to spring training in 1945. He reported a mere four days after being fitted with a new artificial leg in the US. He joined Bluege’s staff to pitch batting practice in 1945, but was activated to the pitching staff later in the year. On August 4 Boston was throttling the Senators at Griffith Stadium, leading 14-2 after four innings. With the game as good as lost, Bluege knew there was no better time for Shepard to realize his dream of pitching in the majors. He inserted Shepard into the game in the fourth inning. Shepard struck out George Metkovich to end the fourth inning, garnering wild applause from the crowd. Shepard pitched 5? innings of relief, allowing one run on three hits and striking out two. It was his only appearance in the major leagues. Bluege became the team comptroller in 1955 following the death of Clark Griffith. Under Calvin Griffith, Clark’s nephew, he became the executive secretary as the Senators relocated to Minneapolis after the 1960 season to become the Minnesota Twins. But Bluege’s heart was always in the nation’s capital. He had hoped that major-league baseball would return someday. Eventually, it did, when the Montreal Expos moved to Washington in 2005 to become the Nationals, 20 years after Bluege died. Ossie Bluege died on October 14, 1985, of cardiac arrest. His first wife, Margaret, had died of cancer after they were married for 11 years. Bluege was survived by his second wife, Wilor, and their three daughters, Wilor, Carol, and Lynn. In 1931 the Chicago White Sox were visiting Griffith Stadium. White Sox rookie third baseman Billy Sullivan, right from the campus of the University of Notre Dame, sat in the visitors dugout transfixed with the action on the diamond. The lad was tardy for a meeting. Manager Donie Bush sent a coach to look for him. When the coach asked what he was doing, Sullivan answered, “Been watching that cat out there on third base for the Senators. I guess I was in a trance.”15 The rookie may have been in a daze as he watched Bluege work his magic, fielding grounder after grounder with little effort. It was a vision that many players and fans were well acquainted with across the American League. Deveaux, Tom, Washington Senators 1901-1971 (Jefferson, North Carolina: McFarland, 2001). Kirkpatrick, Rob, Cecil Travis of the Washington Senators (Lincoln, Nebraska: University of Nebraska Press, 2006). 1 Shirley Povich, Washington Post, June 24, 1971. 4 Jane Levy, “Ossie Bluege: The Quirkless Man,” The National Pastime, Society For American Baseball Research, Winter 1987, 18-21. 5 Henry W. Thomas, Walter Johnson: Baseball’s Big Train (Lincoln, Nebraska: Bison Books, 1995), 186. 6 Bill Hengen, The Sporting News, July 10, 1971, 15. 11 Norman Macht, Connie Mack: The Turbulent and Triumphant Years (Lincoln, Nebraska: University of Nebraska Press, 2012), 444. 12 Bluege’s file at the National Baseball Hall of Fame, Cooperstown New York.